Hand towel There are 12 products. Hand towel 50x50 cm, bee, 100% cotton jacquard. Colors on hand towel: orange and white. Hand towel 50x50 cm, Olive trees in Provence, 100% cotton jacquard. Colors on hand towel: green and white. Hand towel 50x50 cm, cicada, 100% cotton jacquard. Colors on hand towel: coral and white. Hand towel 50x50 cm, Lavender, 100% cotton jacquard. Colors on hand towel: blue lavender and white. Hand towel 50x50 cm, Olive trees in Provence, 100% cotton jacquard. Colors on hand towel: green apple and white. Hand towel 50x50 cm, Vines, 100% cotton jacquard. Colors on hand towel: grey and white. 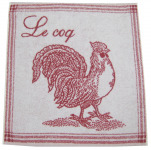 Hand towel 50x50 cm, rooster 100% cotton jacquard. Colors on hand towel: red and white. Hand towel 50x50 cm, Surfine Olive oil, 100% cotton jacquard. Colors on hand towel: green apple and white. Hand towel 50x50 cm, Poppies 100% cotton jacquard. Colors on hand towel: poppy and white. Hand towel 50x50 cm, House of chocolate 100% cotton jacquard. Colors on the kitchen towel: brown with cocoa, cup and chocolate bar drawing. 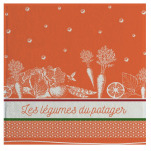 Hand towel 50x50 cm, vegetables from the kitchen garden 100% cotton jacquard. Colors on the kitchen towel: orange and white with vegetable garden (carrots, beans, cauliflower, salad and tomatoes), inscription "Les légumes du potager" surrounded by 2 strips, 1 red and 1 green. Hand towel 50x50 cm, Aromatics 100% cotton jacquard. 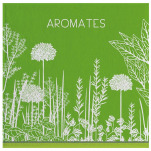 Colors on the kitchen towel: green and white with drawing of an aromatic field, inscription "Aromates".